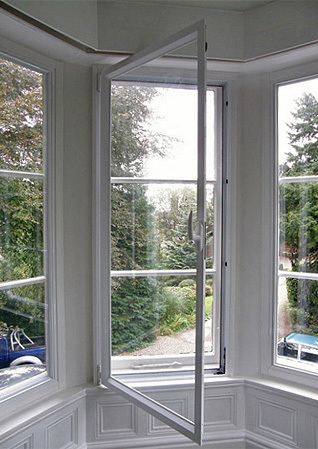 Secondary glazing offers an ideal solution for situations where full replacement windows is undesirable or impossible. Equally suited to domestic and commercial applications, secondary glazing is also a perfect option for use in listed buildings and conservation areas, allowing the original windows to be retained, while offering substantial benefits in terms of noise reduction, enhanced energy efficiency, better security, and condensation limitation. The units we supply and fit are available in a range of options, including fixed glazing, vertical sliding, hinged casement, horizontal sliding, tilting and lift out designs. All are manufactured to extremely high standards and fit internally, behind your existing units. They are designed to be unobtrusive, attractive and high performance. Installation is relatively straightforward and usually involves no disruption and no requirement for subsequent redecorating. This alone makes contemporary secondary glazing a relatively low cost solution. The units we supply are suitable for virtually any installation, and available in an almost endless choice of styles. We can also have units custom-made to suit unusually-shaped windows. In addition, we offer options for large areas of glass, including door openings and feature windows. Units are available in a range of alternative finishes, and all are covered by a comprehensive, long-term guarantee. Please call us on 01536 601292 or 07720 626165, or click here to contact us for more information about secondary glazing.